Heart Handmade - Crafts, craft ideas and arts and crafts blog: Pretty in Pink... of course! Pretty in Pink... of course! Yummy yummy ! Things in pink! I love it! 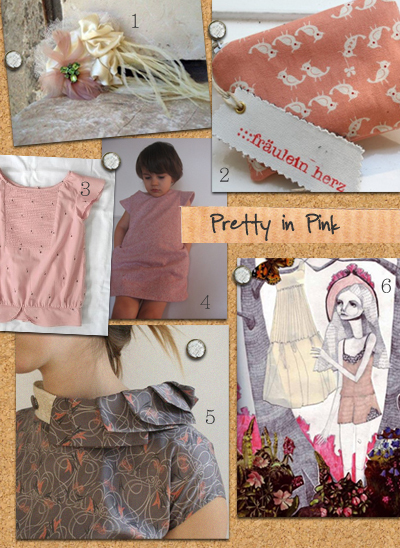 You know I love a good round up of pink! I really wish I was the kind of girl who could wear that hair piece and not feel like a complete jerk. It's too cute! I'm so into pink lately, especially with brown. It kind of tones down the frilly part, I think. Love the collage, #6, the drawing style is so nice! Thank you so much for featuring my flapper top! Love the blog, xo! Heather, I'm planning to paint an entire room in the house pink... I'm a little scared so I'm letting the thought marinate in my head a little before taking the plunge!